The uranium spot price is currently trading at US$46.50/lb, up 14% from 3 months ago (US$40.75/lb). The Fund Implied Price (FIP) is US$47.50/lb, which compares with US$46.00/lb Jan '10. The long term contract uranium price is US$60.00/lb. It is up from US$58/lb 3 months ago. There are 493 new nuclear reactors planned or proposed globally as of August '10. Global supply 2H10 is expected to increase, with stronger production from Kazakhstan, Ranger, Olympic Dam and continued ramp-up at Kayelekera. There is potential for production to decline in Niger where Areva is understood to have withdrawn expat staff following a series of kidnappings in the country. Utility purchases remain discretionary though timing of demand from long term Chinese inventory build remains a factor and will continue to influence short term market trends, as will, increasingly, Japanese and Indian utility purchases. The Merrill Lynch Uranium Equity Index (a basket of uranium equities) is up 4% over the past month, up 9% over 3 months and down 17% over the past 12 months. The market valuation of Australian companies with one or more uranium projects is up 18% over the past month, up 29% over the past 3 months, and up 18% over the past 12 months. This compares with Canadian companies with one or more uranium projects, up 22% over the past month, up 28% over the past 3 months, and up 43% over the past 12 months. Resource Capital Research ("RCR"), an equity research company which focuses on small and mid size resource companies, today launched its major quarterly research report covering 17 global uranium exploration and development companies. 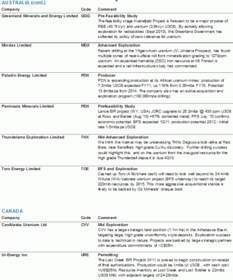 The quarterly report typically reviews companies listed in Australia, Canada, USA and UK and active in established uranium districts globally, including Australia, Canada, USA, Argentina, Peru, Mongolia, Zambia, Tanzania, Niger and Namibia. To access the free summary report or to purchase the complete 98 page comprehensive report, go to www.rcresearch.com.au/reports. RCR also publishes gold, iron ore, and tin-tungsten sector reports. The market valuation of Australian companies with one or more uranium projects is up 18% over the past month, up 29% over the past 3 months, and up 18% over the past 12 months. This compares with Canadian companies with one or more uranium projects, up 22% over the past month, up 28% over the past 3 months, and up 43% over the past 12 months. In the past 1 month, the uranium mining majors have had mixed share price performance: Cameco (CCO) is up 5% (3 month performance +18%), Denison Mines (DML) is up 14% (3 month performance +26%), Uranium One (UUU) unchanged (3 month performance up 28%), Energy Resources of Australia (ERA) up 1% (3 month performance -5%) and Paladin (PDN) down 4% (3 month performance -3%). The UUU three month price increase (+26%) is attributable to the announced ARMZ transaction; and ERA's 6 month price decline (-30%) is attributable to a number of factors including the impact to sentiment of the decision to subsume nearby uranium deposit Koongarra (Areva) into Kakadu NP. The uranium spot price is currently trading at US$45.50/lb, up 14% from 3 months ago (US$40.75/lb) and compares with US$44.50/lb at the start of the year. The Fund Implied Price (FIP) is US$47.50/lb, which compares with US$46.00/lb Jan '10. The FIP has generally been a good leading indicator of near term spot price performance. The uranium spot price is expected to find a floor around US$45-50/lb. The gradual downward drift in spot and contract prices over the past 12 months reflects in part the tremendous growth in new mine supply from Kazakhstan's ISR projects. Recent price influences driving the spot market up to US$48/lb are not entirely clear, though traders point to purchases from major producers. Utility purchases remain discretionary though timing of demand from long term Chinese inventory build remains a factor and will continue to influence short term market trends, as will, increasingly, Japanese and Indian utility purchases. WNA expects the market to remain in modest surplus through 2013/14. Supply 2H10 is expected to increase, with stronger production from Kazakhstan, Ranger, Olympic Dam and continued ramp-up at Kayelekera, partially offset by a potential decline in production in Niger where Areva is understood to have withdrawn expat staff following a series of kidnappings in the country. The long term contract uranium price is US$60/lb, up from US$58/lb three months ago. It is down from US$61/lb Jan '10, though has been relatively stable since peaking at US$95/lb from May '07 to March '08. Kazakhstan ISR production is forecast to reach 47mlbs in 2010, up from 36mlbs in 2009 (+30%) and potentially rise to 78mlbspa U3O8 by 2018. At the recent WNA conference in London, Kazakh officials indicated they will expand production capacity only so far as demand and price warrant. Currently there are 440 nuclear power reactors in operation and 59 under construction. There are 493 new nuclear reactors planned or proposed globally as of Aug '10, up from 435 Dec '09 (+13%). A total of 84 new reactors are scheduled to be commissioned by 2017. As of Aug '10, countries with the largest number of planned and proposed new nuclear reactors are: China 153; India 60; Russia 44; USA 31; South Africa 27 (mostly smaller modular reactors); and Ukraine 22. Since Dec '09 the largest increases in announced planned and proposed new nuclear reactors are in India, increasing from 38 to 60 (+22, up 58%); and China increasing from 125 to 153 (+28, up 22%). Greenland Minerals and Energy -- Greenland Government amended the Standard Terms of Exploration Licenses that allows for the inclusion of radioactive elements as exploitable minerals for exploration and evaluation. This allows GGG to advance the world class Kvanefjeld rare earths and uranium project through DFS (expected 2011). The Australian federal government has scrapped the formerly proposed RSPT -- resource industry super profits tax -- which was to apply to all mining resource sectors, and in its place is proposing the scaled down Mineral Resource Rent Tax (MRRT) which is applicable only to the iron ore and coal sectors. Aura Energy announced (Aug '10) enhanced metal extractions from bioleaching at the large multi-metal Haggan Project, Sweden. Initial test results indicate Alum Shales may be amenable to bioheap leaching at low capex and opex. The project's Inferred Resource includes 291mlbs U3O8 grading 162ppm. "Producer buying has driven the spot price from ~US$40/lb three months ago to a recent high of US$48/lb, and is currently US$46.50/lb. With stronger global production anticipated 2H10, there is potential for the spot price to fall back slightly though we expect the long term price to remain well supported on strategic inventory purchases from China, India, Japan and Germany," John Wilson, Managing Director of RCR, said. 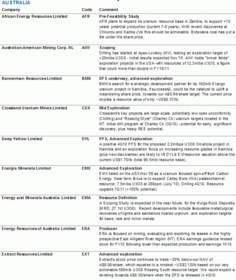 Resource Capital Research ("RCR") (www.rcresearch.com.au) was founded in 2004 and is based in Sydney. RCR provides investors with in-depth reports on current investment opportunities in the mining sector both in Australia and globally. The focus is on small and mid cap resource companies, within the gold and uranium sectors, ranging from exploration stage through development and production. John Wilson the principal of the firm and analyst has over ten years' experience analysing mining companies in Sydney and on Wall Street including for major investment banks. The report is available at www.rcresearch.com.au. The next Uranium Sector Review will be published in the December Quarter, 2010. RCR also publishes the Gold Company Review, Iron Ore Company Review, Rare and Minor Metals Company Review; and a Copper Company Review -- out soon. Abbreviations: WNA - World Nuclear Association, ktpa - thousand tonnes per annum, lb - pound, Mlb pa - million pounds per annum, U3O8 - uranium oxide.